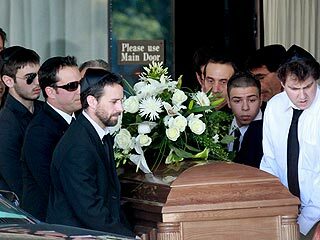 Corey Haim Laid To Rest – Corey Feldman Makes It About Him. Again. I’m not sure if you’ve ever noticed, but Corey Feldman has quite an ego. And it may just be me, but it really seems like he makes everything about him every chance he gets. Like when his friend Corey Haim died. Now, I understand they were close and had a deep connection most of us will never know, but I still got a bad taste in my mouth when Corey Feldman released his statement the day Corey Haim died. Today Corey Haim was laid to rest and Corey Feldman wrote an open letter to his dearly departed friend on his website. This is for you on the day of your funeral. First off I am so sorry I am not there with you today. By that I mean my physical body is not with your physical body. However you know that my heart is right at your side. You also know the only reason I am truly not there is out of respect for your mother and her wishes to minimize the media attention as much as possible. I want your family to have a calm peaceful day. Hopefully we will not see one shot of the funeral on the news. Just know I am at home today projecting positive energy for you and your passing. I ask again, do you see what I see? I feel as though it’s all about Feldman more than it is about Haim – and that’s just tacky and wrong. Maybe I’m just reading into things too much because of my disdain for Corey Feldman and his misplaced ego. Or maybe I’m totally and completely right. Have you any opinion on the matter? next post: It’s St. Patrick’s Day 2010 – Time To Drink! !